New Delhi: If you think you are middle class, or belong to the middle of India’s income distribution, you are most likely to be wrong. But you are not alone. An overwhelming majority of the richest Indians consider themselves to be middle class and at least a third of those actually in the middle of India’s income distribution pyramid consider themselves to be poor. These are the rather stark results from a large-scale nationally representative survey conducted this year. The ‘Household Survey on India’s Citizen Environment & Consumer Economy’ (ICE 360° survey) conducted this year shows that only 3% of the top percentile, or the richest 1% Indian households, consider themselves to be rich. 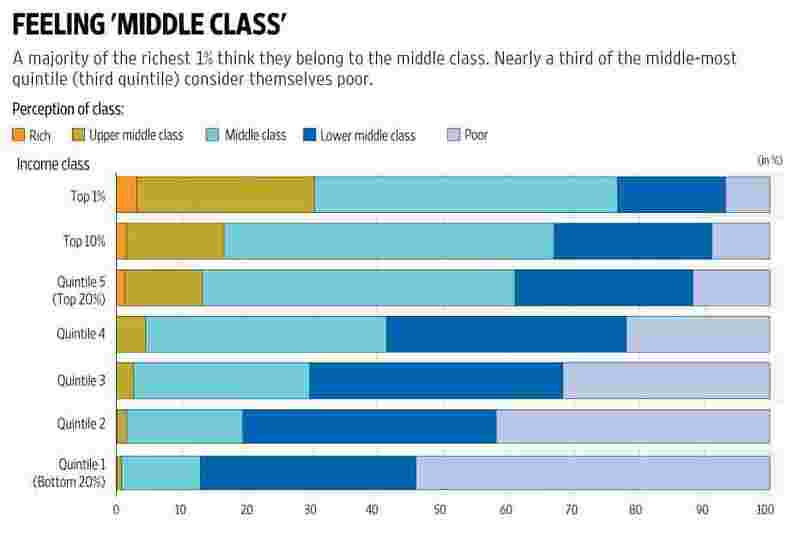 The rest consider themselves to be either middle class or poor. There is, of course, no objective definition of the middle class but if it means anything, it is that it must exclude the wealthy and the poor from its ranks. Unfortunately, that’s easier said than done in a country where those in the middle of the income distribution are vulnerable to income shocks that may throw them into poverty all of a sudden and where, by global definition—those with per-capita incomes between $10 and $20 a day—only the top 3% belong to the global middle class, as a 2015 Pew Research Centre report pointed out. Even if one were to apply non-income yardsticks and consider ownership of assets and amenities, only a small fraction of Middle India, or the middle 60% of India’s income pyramid, will qualify as middle class, the ICE 360° survey shows. Middle India is largely rural, barely educated, and has considerably lower ownership of household assets and vehicles, the survey shows. Sixty-nine per cent of Middle India is rural while only 6% of Middle India lives in the metros. 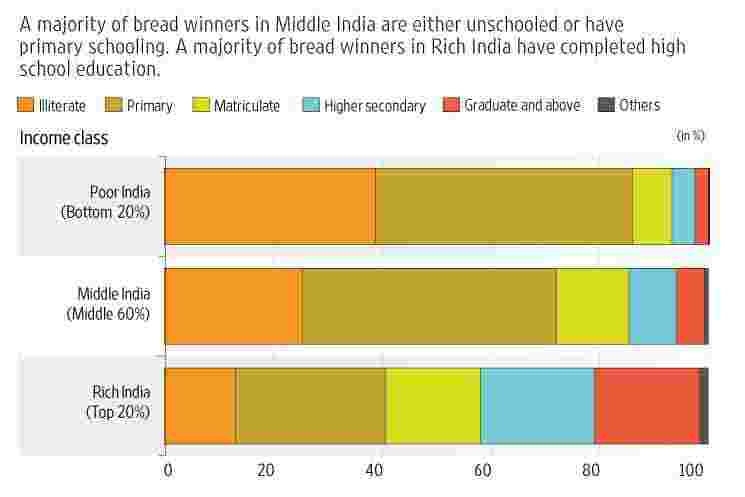 Seventy-two per cent of breadwinners in Middle India are either unlettered or have received only primary schooling. Most of them are either self-employed or labourers, and very few (17%) have regular salaried jobs. 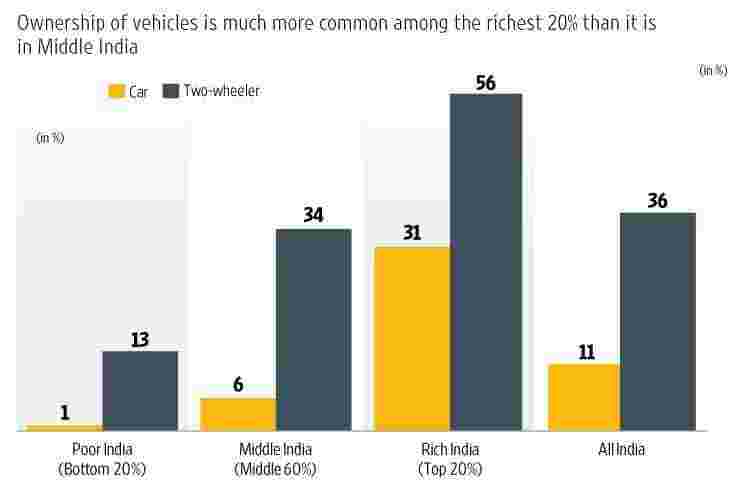 The contrast with Rich India, or the richest 20%, is stark, as the accompanying charts show. In sheer size, Rich India is a third of Middle India but in terms of the share of the consumer economy, Rich India accounts for a disproportionately large share. In terms of spending on consumer durables and household appliances, Rich India outspends Middle India. 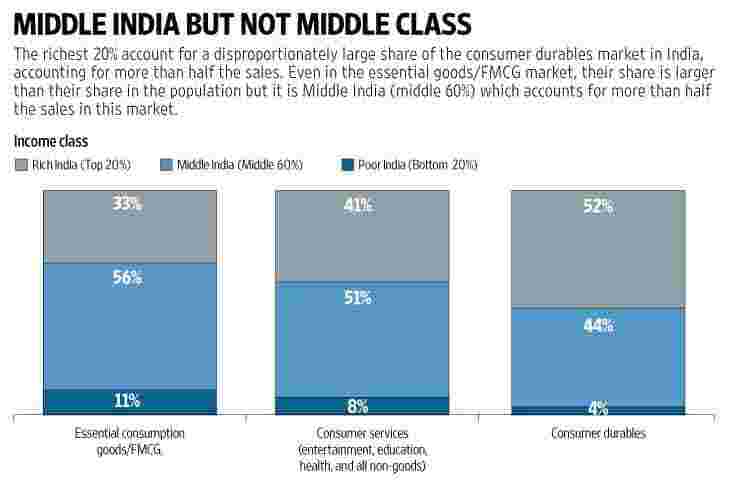 Collectively, Middle India spends more on consumer essentials compared to Rich India. But Rich India has a greater share of the consumer essentials market than is warranted by its share of the population, indicating that on a per-capita basis, those belonging to Rich India consume much more of essential consumer goods than those belonging to Middle India. 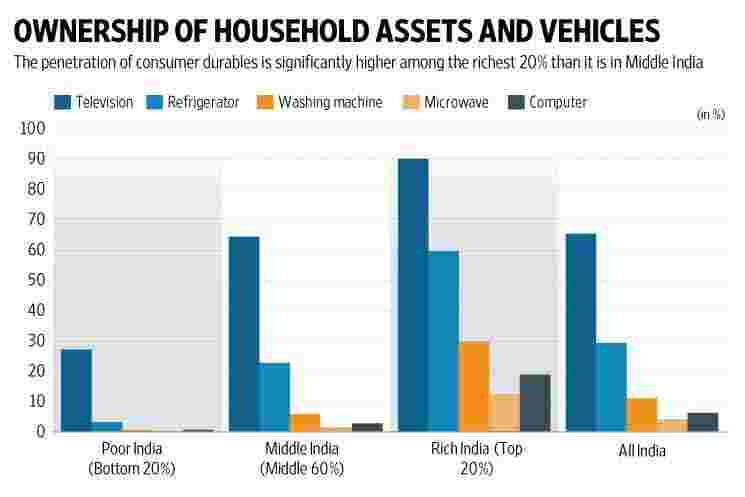 In ownership of cars and household assets such as refrigerators and washing machines, there is a wide gulf between Rich India and Middle India. The gap is lesser when it comes to ownership of TVs and two-wheelers. The differences in education, occupations, and ownership of assets are also reflected in the distribution of income. While the (reported) average monthly household income of Rich India is Rs29,775, the (reported) income of Middle India is less than half that figure at Rs13,636. What these statistics suggest is that in our country, only a very small fraction of Middle India has middle class characteristics such as regular earnings, ownership of vehicles, and ownership of household appliances. 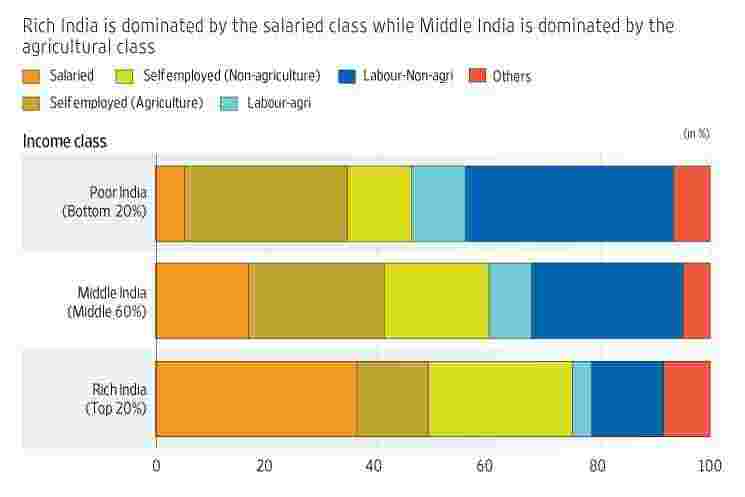 Most of Middle India is not middle class yet, the survey seems to suggest. However, it is Middle India that is likely to contribute most to the ranks of the Indian middle class over the next few decades, as income and education levels rise, and asset ownership grows in this group. The ICE 360° survey was conducted by the independent not-for-profit organization, People Research on India’s Consumer Economy (PRICE), headed by two of India’s best-known consumer economy experts, Rama Bijapurkar and Rajesh Shukla. The survey is among the largest consumer economy surveys in the country. The urban sample of the survey is comparable to that of the National Sample Survey Office (NSSO) consumer expenditure survey conducted in 2011-12. While the NSSO surveyed 1,01,651 households, of which 41,968 (41.3%) were urban households, the ICE 360° survey covered 61,000 households, of which 36,000 (59%) are urban households. The rural sample of the ICE 360° survey is less than half of the NSSO sample. Nonetheless, all the estimates of each region have been derived by adjusting for the respective population of those regions. This is the fifteenth of a 16-part data journalism series on how India lives, thinks, earns and spends, based on the latest results from the ICE 360° survey (www.ice360.in/) conducted by the People Research on India’s Consumer Economy (PRICE) in 2016. The concluding part will look at perceptions of governance among Indians.